Let me paint the picture for you; It’s Tuesday night in Pickering, some people are just leaving work, some are home, a few are out with their kids starting the holiday shopping. I’m waiting for Anna to get home with the kids, I haven’t eaten all day so I decide to hit up the East Side Mario’s around the corner from her house. I preferred to sit at the bar and get some work done while waiting for Anna, but there was no room. The hostess offered me a seat in the middle of an empty dining room; I asked if I could please have a booth at the back by the wall (I didn’t plan on staying long). I understand she didn’t want to give up prime real estate but she was still sitting offering me a four top table. However, at the end I was seated in a booth. My sever a young guy not older than 21 approached my table and asked me if I would like a drink, I ask if they have Sauvignon Blanc (it’s a safe bet in a quick service dinning establishment) and the kid points to the wine in the menu and tells me that is what they have…so I go with the Pinot Gris. 5 or 8 ounces? 8 obviously. Five minutes later he arrives with my wine (which by the way is not 8 ounces) and asked me if I am ready to order. I have the Wedding Bell soup (I am a sucker for it where ever I go, I just can’t help myself) and the Grilled Chicken & Caprese Salad. I don’t even have time to blink and he brought me my soup, WOW! I’m not going to complain about that because if I was a mother there with my kid that is the kind of quick service I would need. 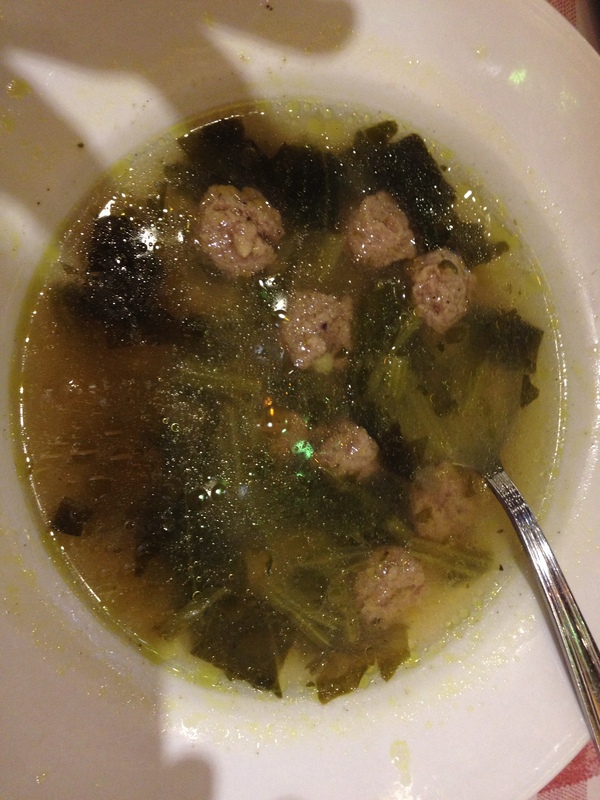 I took at picture of my soup because I was surprised at how little Confetti pasta was in it- more like an 8 small meatball soup with a few pieces of spinach. I have to say, I did expect more for my $5.95. I was working away enjoying my soup when my salad arrived, it looked good. I was surprised at how good it looked, and tasted. Well done I thought! As I was munching away I was thinking about the Safe Food Handling Coarse I took last week and wondered what kind of things were happening in the kitchen, then as I was cutting my tomato…I saw the hair. Yes the hair. GROSS, it’s a HUGE deal; hair in your food can make you very sick! Does the word Staphylococcus aureus scare you? I won’t go into detail what the hair looked like…but it was just as bad as you can imagine. Now for the good part, I flagged down my server who took one look, grabbed my plate, winked at me and said “I’m going to bring this to the Manager” – who not one minute later was at my table. “I am so sorry, I’m sure you are very turned off but if you are still hungry whatever you like”…whatever I like I thought? On the house, if I ordered a steak would you cover it? I didn’t. I told him the story about my class as I was tweeting at East Side Mario’s and said I would just like a small green salad. To which he heard, bring this lady the biggest salad the kitchen can make and watch her like a hawk to make sure everything is okay from here on out. The salad was massive, but I finished every ounce of ice burg lettuce they put in there! I don’t want this blog post to come across as a complaint but more of a complaint and complement. I know how hard it is to have young people working for you, and I also understand that your kitchen staff are not trained chef’s, if it wasn’t for the wonderful manager this post would be very different. He did his job very well, I walked away happy. Although I would have been happier if my soup or my whole bill for that matter would have been picked up by East Side Mario’s – two glasses of wine a soup and salad…cost me $25.00 cost East Side Mario’s … $5.00, oh I still gave my server a tip, yes I’m Canadian like that. I didn’t receive a comment card on my way out, so here they are. Manager deserves a raise, he was great! Addressed the problem on the spot, and came back after to make sure I was happy. Servers were yelling across the dining room at each other to see who could break a $20….really take it to the back. Will I go back? Conclusion, I don’t eat there often, so most unlikely. Will I tell everyone I know about my experience, yes – aren’t you reading my blog right now. 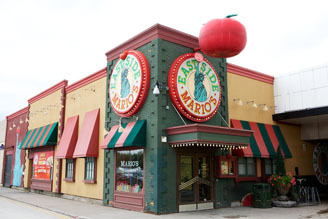 If and when East Side Mario’s responds (which I hope they do) I will post it. As promised here is the response from East Side Mario’s. They were great about getting back to me in a timely manner, I have been slow to post it. Hi Heather. I received your feedback of your most recent visit with us and wanted to get in touch with you personally and apologize. Our goal is to treat every one of our guests as if they were guests in our own home. In saying that, it sounds as though we did somethings good and others not so much. We have systems in place to ensure that food goes out piping hot and correct to spec. However in this case your soup was not properly mixed with confetti pasta and spinach to meatball ratio. Sorry for that, we aim to make each dish/soup the same each time. 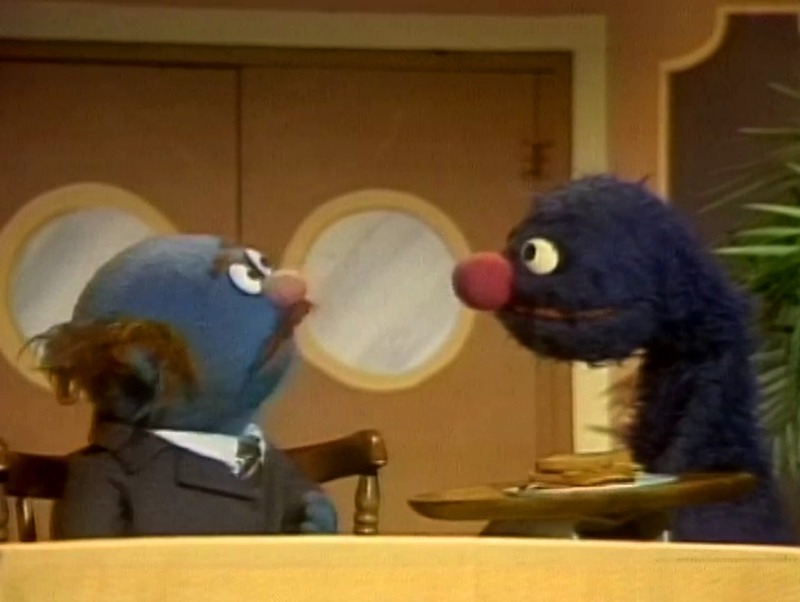 As for the hair in your food, again i apologize for this, we do ensure all kitchen employees wear hairnets and in some cases beard nets to make sure we can avoid this. I was happy to hear that the issue was brought to the manager and dealt with promptly. The restaurant industry is a very competitive one with guests having several options. I appreciate that you choose East Side Mario’s and hope you try us again and again. Please provide me with your mailing address and i will send you out a coupon in hopes that you give us another shot. Happy blogging. I enjoyed reading your other reviews as well. Hi Mike, thanks for getting back to me so quickly. I would be more than happy to try out the restaurant again with a coupon. This time I will bring my best friend who has two small children as I think it’s more of a family restaurant, and the kids will enjoy their experience. I look forward to receiving something soon. Oh boy. Well that’s a good story overall I guess. It reminded me that the other day I was eating a bowl of pasta in a cafe outdoors and a gust of wind blew and the next thing I looked down and there was a gigantic long black hair in my bowl – ewwww. But what was I to do? I loved the pasta I was eating, it wasn’t he restaurant’s fault, just an act of nature. So I picked it out quickly and continued eating. Have to say it didn’t taste quite as good after that and I gave most of the rest to Husband. What would you have done?